Saturday, July 17th, marked 43 years since John Coltrane’s life was cut short by liver cancer at the age of 40. 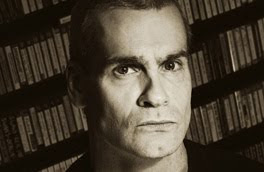 Paying tribute to the man who “might be my single favorite musician besides maybe Ian MacKaye or Jimi Hendrix,” Henry Rollins took the opportunity to devote an entire episode of his Harmony In My Head radio show to Coltrane. The broadcast can be downloaded at the Harmony In My Head archive site, or check it out at KCRW. Fanatics! Tonight is a very cool show. It’s all Coltrane, all night. On July 17, 1967, John Coltrane, a Jazz giant, passed away at age 40. It would be perhaps a little brighter occasion if this was Coltrane’s birthday. I couldn’t let this opportunity to pay tribute and homage not only to the man and his greatness but to his amazing bands. The Classic Quartet of Elvin Jones on drums, Jimmy Garrison on bass and McCoy Tyner on piano. Also, we are going to listen to Coltrane’s later line up of Jimmy Garrison on bass, Rashied Ali on drums and Alice Coltrane on piano. In a mere two hours, we cannot hope to possibly do more than barely acquaint ourselves with Coltrane’s massive body of work. Tonight, we are only listening to Coltrane’s Impulse label era. We’re not tapping his amazing Atlantic recordings, any of the ones he made with Miles Davis, or his early solo work on Prestige. Just my opinion, I think that Coltrane reached his greatest strength when he met up with producer Bob Thiele and Impulse. The Classic Quartet is one of the greatest examples of the sum of the parts being more than the individuals. All of them on their own are amazing but together, forget about it. What a band! Check out Elvin Jones, what a monster player. I don’t think there was a better match up for Coltrane at that time of his development than the Tyner/Jones/Garrison machine with him. Listen to how completely these musicians invest in each track. It is total commitment every second. After My Favorite Things or Impressions, you can’t believe the band is still standing to hear the applause! We have a treat here with Johnny Hartman singing the great Billy Strayhorn classic Lush Life with the Quartet on track six tonight and on track seven, we have Roy Hanes sitting in place of Elvin Jones. I know that many if not almost all of you Fanatics are into the Coltrane. If you have not waded into the big man’s catalog, I would recommend you check out any of the albums that you liked the track from tonight. They are all easy to find on CD, many on LP and also on the i-Tunes. I always thought Coltrane was plugged into some very direct current, some human mainline, like Jimi Hendrix or Charlie Parker. 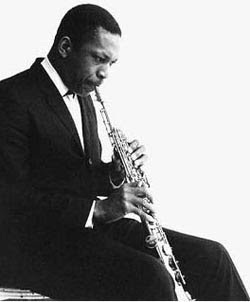 Like Jimi Hendrix, John Coltrane is one of those huge musicians in my listening. I hope you go far and deep into Coltrane’s music. It’s worth every minute you spend. Like I said, it’s a little heavy to acknowledge someone on the day they died as a way to celebrate their music but the date was too great a chance to pass up.